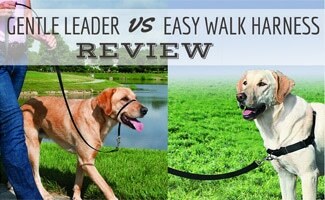 Gentle Leader vs Easy Walk Harness: Which Should You Pick? Does your dog have issues pulling on the leash, barking excessively or lunging and jumping while walking? Not every dog is a perfect Lassie. So a training leash is a helpful tool to tame your pup’s anxiety and aggression. Can You Use Both The Gentle Lender & Easy Walk Harness? Two popular training collar options are the Easy Walk Harness and Gentle Leader Headcollar. Both can help train against unwanted behavior, but they are not identical products. So when comparing side by side, we wanted to point out the features of each. To help you see which one you should pick, take a look at the table below. 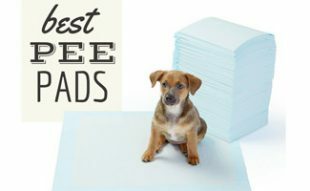 After reading, you may decide that your dog could benefit from both (more on that below). 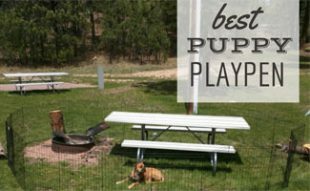 Why is the gentle leader effective for dogs who pull? Because the Gentle Leader harness applies gentle pressure on the nose when the dog does a pulling action. Putting the Gentle Leader on correctly is critical to its effectiveness, so watch this 1-minute video from Austin Pets Alive to see how this head collar should be worn appropriately. The Gentle Leader head collar is sized by weight, whereas the Easy Walk dog harness uses chest and girth measurements. The Easy Walk harness has four adjustment points, so your dog is comfortable and has a reliable fit. There is a martingale loop in the chest piece to prevent twisting and the quick snap buckles on the shoulder, and belly straps make it easy to put on and take off. The collar sits high on your dog’s neck without putting any pressure on the throat. Can You Use Both The Gentle Leader & Easy Walk? These two tools are fairly inexpensive. So, if your dog has issues with pulling on the leash and lunging, you may want to purchase both. You can then apply the training tool that makes sense in a particular situation. For example, you may use the Easy Walk at the park but the Gentle Leader for dogs at the vet’s office. We want to remind you that although these harnesses can be immensely helpful, they are still just one of many training tools. If your dog’s issue is that he pulls on the leash, it’s important that you are consistent with your commands. Also, don’t forget to reward him when he isn’t pulling, so it reinforces good behavior. To further maximize your dog’s walking success you might also consider other dog training collar options or an online dog training class. What issue does your dog have on leash? The Gentle Leader has been a lifesaver for us. We live in an RV resort during the winter. Our lab was pulling and lunging, but no more. We can walk him anywhere in the park. Word of warning on the Gentle Leader. I’ve used it for my German Shepherd for the last 7-8 months. It works great for keeping him on heel and no pulling. The VERY BAD News is that he developed sores on the side of his mouth and jowls. We didn’t know why his jowls, especially on one side were red and irritated and occasionally “crusty” or scabbed. Duh! We stopped using the leader a couple of weeks ago and his jowls have healed. We are looking at trying the Easy Walk. If you look at the design of the Gentle Leader you’ll notice that it goes across the dog’s snout and will rub the back part of his jowls with any tension applied by the dog or by you during the walk. Too bad, because as a walking and training aid the Gentle Leader is great. I am wanting to buy an Easy Walk Harness, but am having trouble finding one to buy. One crowd advertise they keep it in store and they actually don’t. Where can I buy one please? You can purchase it on Amazon with this link. My daughter has a Doberman and just bought a gentle leader and he’s being stubborn and not wanting to poop like his normal times like in the mornings. He waits til lunch. I would be cautious about the gentle leader on a doberman. As I was warned,They can be prone to neck issues, especially with head halters. Their bodies and so fast and strong compared to their head and neck proportions that they can hurt themselves. I use an easy walk with mine and it works very well. I have a 16 week old Beagle puppy that pulls a lot when we go for walks. She wears a SPORN harness to prevent pulling but it’s not working. Even if I tighten it she STILL pulls. She doesn’t seem to care. Which harness do you think might work better on her? I’d really appreciate some advice. As she is starting puppy school soon, and I would like to at least tone down the pulling. Hi Zoe, We use the Gentle Leader on our strong-pulling Lab, Bella, and it works like a charm. It is the only thing I have found that stops her from either pulling or choking herself. 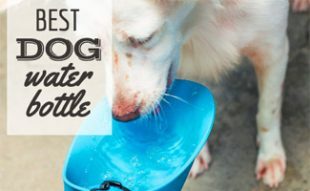 There is no guarantee that it will work for your dog of course, but it sure has helped us. This is very informative. Thanks for posting all the pros and cons of this product. I have a young Basset who has just turned a year. He is quite lean but girth measures 63 cm when last measured. The problem is in training he pulls – I have tried several harnesses on him and the recent was the PerfectFit Harness which supposedly was guaranteed against pulling – but he still pulls if he cannot get away using front muscles he uses his back muscles to pull and is really strong. What would you suggest be used for him in training so that he does not pull? 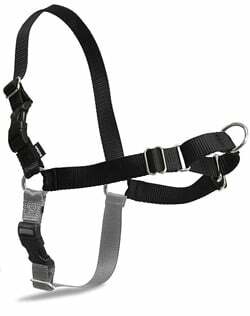 Hi Amy, if you’re looking for a replacement harness I’d recommend you consider the Easy Walk Harness. However, it depends what types of issues you run into with her on leash. Does she bark, pull, etc? Or is the main issue that she’s an escape artist? can go which means that when they are adjusted correctly they will not choke the dog, just tighten a LITTLE BIT if they try to back out of the collar which stops them from escaping. The best martingale collar is the PetSafe quick release martingale. If you don’t buy that one, just make that the one you get has a fabric loop (Not chain; it can get stuck when it tightens) and make sure it has quick release buckles. Martingale collars should only be used for walks and should not be left on a dog 24/7. Goof luck! I bought easy walk harnesses for all 3 of my dogs & am sorry I did. I have GSPs which have very deep chests but narrow shoulders. The easy walk is supposed to be adjustable but I could never adjust them properly for my 2 bigger dogs (both got sores); I can sort of use it for the younger one but it doesn’t stay adjusted. I’m disappointed. Hi CJ, we had a similar issue with using it on our dog. I think we’ve adjusted it properly but since she pulls so much it moves quite a bit on her. We actually just started taking her to a trainer this past weekend and I think it was more “user error”. Basically, we were walking our dog incorrectly (didn’t know you could do that!). A dog should walk beside you and follow your lead. Your dog shouldn’t be walking ahead and leading you because that gives her the impression that she is the alpha. Because our dog was walking ahead of us, she was pulling and moving every direction and the harness moved with it. I think once we get her walking correctly the harness will work better for us. I must say that as an owner of a service dog, my dog leads in front of me like a guide dog as I have PTSD. I am sometimes stopped at least a few times a week by people telling me that my dog is not obedient. He is highly trained and taught to walk specifically like this. I was speaking about dogs who do not perform jobs. Dogs who perform jobs, such as yours, may have other guidelines for how to walk them. Most of us considering harness and head collars do so because we don’t want to use pinch collars. Look them up on the RSPCA website. Totally understand and respect that. We tried everything for our dog including using the Gentle Leader and Easy Walk Harness. They didn’t seem to resolve all the issues for our dog, which is why we chose to use a pinch collar. Each pet parent has different comfort levels and dogs have different needs, so I wanted to share my experience in case it might help someone else out. I bought the Easy Walk Harness for my 63-pound Border Collie/Black Lab Cross because walks had become so uncomfortable for me from her pulling that I finally stopped walking her. I was led to believe that the harness would help control the pulling and jerking, but it not only didn’t help, she was even less controllable than when we used a ‘choke-chain’ training collar. I felt that she could have easily pulled me over if I had been less steady on my feet. I’m sure it has been fitted to her correctly according to the instructions, and I believe the purchase was a waste of time and money. I’d still like to have walks with my wonderful (in every other way) pet. 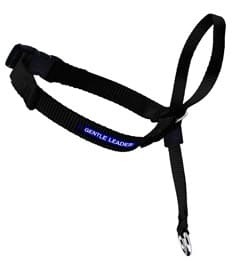 So I’m on this site to consider buying a gentle leader head collar. A good idea? or wasting more money and time? The Gentle Leader worked for my dog, and I used to use an Easy-Walk Harness, but stopped because it didn’t work and was rubbing. Absolutely the same same problem! Glad to here I’m not the only one! My dog is very slim except for her BARREL chest, and it always rubbed on her too. Try the Gentle Leader, it worked better for me. Our Large Munsterlander has the same physique, deep chest and narrow shoulders. Try ‘The Perfect Fit’ harness. This has a front attachment and it fits perfectly! 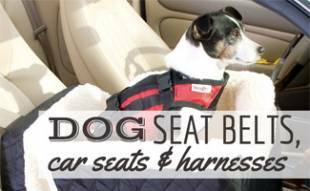 My husband and I purchased the Easy Walk Harness for our dog in late February after I wrote this article. The harness tends to move on her some. We are unsure if we have it fit properly. We’ve read the instructions and watched videos but the harness seems to move on her during our walks. She still seems to pull too, but it’s manageable. Anyone have any tips? It seems like you may have a size too big but perhaps she will grow into it? Or try adjusting it smaller. Our dog Bella uses the Easy Walk too and it is the ONLY thing that allows me to keep ahold of her when we walk by other dogs she wants to meet! Yeah I was wondering if the sizing was off. We purchased the medium/large for her. She weighs 50 pounds but I haven’t measured her with a tape measurer. Maybe I will do that when my husband gets home. Last night she was a little more rambunctious on our walk and she was a little more difficult to manage. Hopefully we figure out a solution! Thank you! Well what size did you get, and what size is your dog? I got my dog a medium/large. She’s about 55 pounds. I don’t remember what her measurements were but they were within the suggested range. I really don’t like the easy-walk harness for the reason that it chaffs many dogs, and like most harnesses, has to be really snug to work right. I found a “Sporn Non-Pull” harness, it has fleece padding, and tightens under her front legs when she pulls. (If she doesn’t pull, it remains totally loose.) It doesn’t eliminate pulling, but doesn’t rub. I recommend for light-medium pullers! We just ordered the Gentle Leader last night off Amazon. We should get it in a couple days. I’ll try to remember to update everyone on which we like better. Can’t wait to hear! If that doesn’t work I still recommend that “Sporn no-pull” harness–I like it better every single day! Unfortunately, the Gentle Leader isn’t fixing our issue either. I’ll need to explain what exactly we’re dealing with in regards to our dog, Sally. Sally has gotten better at not pulling on leash thanks to our use of a pinch collar. However, she is extremely protective on the trail we walk and barks/lunges at any dog we pass (you can read more about it here). We decided to try the Gentle Leader after my cousin told us that it worked well for her dog. It muffles Sally’s bark and makes her more manageable to “pull” along when she gets barky and lungy on the walking trail. However, she’s still super aggressive/protective. I’d like to state that neither of these harnesses in this article state that they will help with the issue we are facing with our dog, but we wanted to test them out to see what the result would be. Ultimately, neither harness helped with Sally’s pulling; however, I’ve heard successful stories from others so perhaps Sally is a bit more determined/stubborn than other dogs 😉 . FYI: We are meeting with a trainer this coming weekend in the hopes of finding a way to end this behavior. Actually the pinch collar and training has really helped us. Sally is much better on our walks, she isn’t perfect but I’m sure it will continue to get better as we continue to work with her. I believe that using tools and training together can payoff if done properly. We took training classes and were taught how to properly use a pinch collar, which is why I feel comfortable using it on my dog. I’ve been worried about my dog’s neck when I tug on her collar when she’s sniffing around or picking up something on the ground that she’s not supposed to eat while out on a walk. So I’m going to give one of these a try and hope it helps! So, an update–I, or actually my neighbor found a harness that I like and works for my dog! (I know, I just said don’t get any kind of harness and now I’m advertising one!) I left Rosie with my neighbor while I was out of town for 4 days. And Rosie chewed up her Gentle Leader (true, it had been left ON her, which I never did because I was pretty sure I knew the results)! Anyway, my neighbor went to Pet Smart and bought this “Sporn no-pull” harness”. It has a neck collar and then two straps run from it between her belly and up onto her back where a leash ring is attached–the way it works is when the dog pulls, the straps squeeze under its belly, and loosen when it stops pulling (unlike the Gentle Leader which didn’t always loosen after it tightened). The under straps are padded with fleece and it’s only $8 on Amazon. The great thing (to me) is that you can fasten it really loose, and it will only tighten when the dog pulls; this is the best tool I have yet to find!